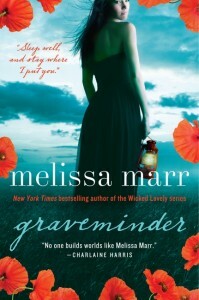 Graveminder by Melissa Marr is creepy and mysterious. Claysville is a town in which its residents are protected, and there is a peculiar bond between the undertakers and the graveminders. Not sure what a graveminder is? Readers quickly get an inkling of what they do and how they take care of the dead in the town. Supernatural beings — both good and bad — are afoot in Claysville, and those that leave the town who were born there are often drawn back by an unnatural force. Rebekkah Barrow is called back home when her grandmother, Maylene, is murdered, and her on-again, off-again love Byron is there by her side as she buries the only family she has left. Although Rebekkah is not a blood relative, she’s got a bigger job to do now that she’s returned, and Byron has to help her. Blood relatives are beside themselves with jealousy, like Cissy, or are indifferent to the situation, like Liz. And the town is full of people who know a lot more than they are willing to speak about aloud. Marr has an excellent sense of how to create atmosphere; her novel reads like those dark movies where the fog machines are making everything misty and the characters are left bumbling around in the dark, trying to hold onto some sense of normalcy. Byron and Rebekkah are surrounded by their pasts with one another and their histories with those in the town, but they must set their troubles aside for the good of the town. Marr is clearly using an allusion to the Faust and his deal with the devil, but in Graveminder, the town has made a pact with the dead. The body count gets larger and larger as the Undertaker and his Graveminder learn their craft, but the question is, will the pact be broken or will they find themselves broken by the pact that gave them no choice about who they were to become? Graveminder by Melissa Marr has an interesting set of characters, though Cissy is a bit too much of a caricature and a little too outrageous in her outbursts. Readers would almost prefer her to be less but more sinister. Quick paced, and action packed, but the drama between Byron and Rebekkah could have been more subtle. Readers searching for a book to curl up with and looking for a bit of paranoia with their late night reading should consider a Graveminder for a companion in the wee hours of the morning. 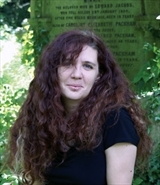 Melissa Marr grew up believing in faeries, ghosts, and various other creatures. After teaching college literature for a decade, she applied her fascination with folklore to writing. Wicked Lovely was her first novel. Currently, Marr lives in the Washington, D.C., area, writes full-time, and still believes in faeries and ghosts. Check her out on Twitter, the Web, Facebook, and “like” Graveminder. To see the other stops on the TLC Book Tour, click the TLC Tour Button. 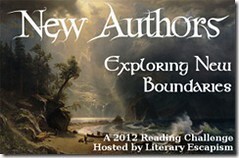 This is my 7th book for the 2012 New Authors Challenge. Additionally, this is a stop on The Literary Road Trip since Melissa Marr is a Washington, D.C., resident and author.